The GVS9000 2XU 4K VTR Rugged 4K playback for projectors or monitors in a convenient and cost-effective package. GVS 2XU 4K combines dual video channels, Fibre Channel and Gigabit Ethernet connectivity with hardware level secure media storage in a compact 2U rack space. 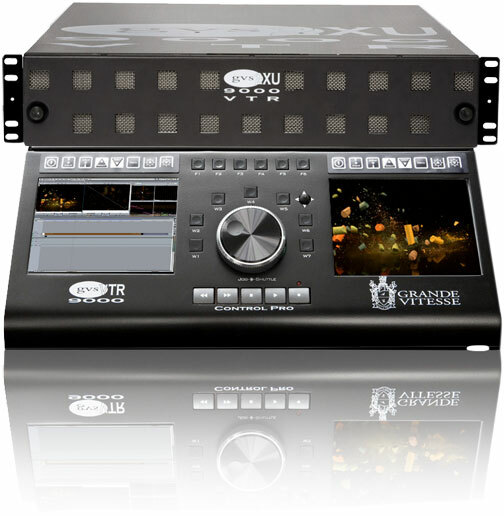 By leveraging the GVS9000 architecture, the 2XU 4K VTR is immediately deployable with GVS Video Tools productivity firmware for ingest, slow-mo 1%-10K% playback frame, and the ability to offer RAW Uncompressed Playback during Recording. Built for film, like the 9000 line of media servers, 2XU 4K VTR is optimized to meet the highly focused needs of the film industry with its demanding reliability and performance requirements. Unlike tape decks, the GVS9000 2XU 4K captures the RAW data from dual HD-SDI interfaces from Sony HDCAM SR Decks • ARRI D-21 • Panavision Genesis • ARRI ALEXA • Phantom HD Gold, Phantom 65, Flex, V10 • GVCAM • RED • Ikegami HDL-F5 • Sony F23, HDW-F900R, HDC-F950 • Panasonic AJ-HDC27 VariCam • Thomson Grass Valley Ciper • All Cameras with HD-SDI Output • and Thompson Viper cameras direct to disk, saving hours in the editing process. In addition, ingest of 2K media provides users with utmost image quality via HSDL (high speed data link) using SDI connections from 2K telecine machines as well as 2K sequential DPX files and 2K QuickTime reference movies created simultaneously. 4K playout via 4xHD-SDI further enhances the flexibility of 2XU 4K VTR to work with other 4K equipment and direct output to projectors compatible with 4K. The playback feature of the 2XU 4K allows 4K material to be previewed on standard HD 24P monitors. 2XU 4K 4xLink supports full bandwidth 4096x2160PsF 25 at 10-bit for 2K, 1080p and 720p formats and can also convert between 4:4:4 and 4:2:2 formats for single 4xLink HD-SDI 3G output. The 2XU 4K can also playback a large number of AVI, JPEG, DPX, MPEG, MXF, IMX and QuickTime files via HD-SDI. And because raw data images are quite large optional proxy files are provided. The 2XU 4K offers concurrent live duplication of content during production. Removable Solid State Disks (SSD) are available as an option. The GVS9000 2XU 4K includes internal, hot-swappable, enterprise-class, media disk drives pack for content storage, local internal ingest and playout. It supports dual channels of 10-bit Uncompressed RAW 4:4:4 RGB HD for the high-definition video I/O at up to 2,800 Mbps, or standard-definition video I/O at up to 100 Mbps, while at the same time handling IP-based file transfer traffic in and out of the system. Video I/O modules and redundant power supplies are also hot-swappable providing uninterrupted operation in the field or studio. Video Format Flexibility: GVS 2XU 4K VTR provides mounting space and power for up to twelve independent I/O modules, which provide video encoding and decoding. GVS 2XU 4K I/O modules currently include a dual channel HD/SD SDI/HSDL input and output channels. There are mixed formats, mixing HD and SD modules, and selection or change, at any given time during recording for master or copy. The use of Fibre Channel RAID storage ensures that the system continues to operate at the speed of 3Gbit/sec., even in the event of the simultaneous failure of any number of the disk drives. In addition, the 2XU 4K VTR offers Dual Fibre Channel connectivity allowing media transfer of 4Gbit or 8Gbit/sec Fibre speed as well as connectivity to a standard SAN storage. The Nomadic1U 12xPro offers an optional 12 external SSD drives. Having the Dual Fibre Channel provides flexibility for broadcast and video production studios, allowing ingested content to be stored in a centralized location without having to move data in between media servers, and offering greater productivity and reliability. Another key feature of the 90002XU 4K VTR is the ability to edit during ingest, allowing editors to be extremely productive. This is most useful when you have only one chance to take a shot such as during sports and other live events. You can't stop the camera, and you have to film without knowing if you have captured that right shot. With the 90002XU 4K VTR you have the option to do a continual roll, going back and forth on your preview monitor, to ensure that the shots that were taken earlier are acceptable and editing content in real time without having to stop the camera. Offering 10 hours of continual recording, the 90002XU 4K VTR is perfect for capturing sequences for action scenes, documentaries, science, oceanography and more. Compatibility: GVS 90002XU 4K VTR is designed with the latest technology of the 9000 family product line but uses the same time-proven, robust code base as GVS9000 VTR Product and works out of the box with a large number of 3rd party applications supported by other 9000 systems, including automation, editors, archiving systems, and GVS Application Tools. Dual Gigabit Ethernet connectivity for asynchronous playback in 2K in digital cinema with direct attaching to 2K projector, or file transfer and support of FTP, SMB and the Apple® File Sharing Protocol, provide simple, standardized, file movement techniques for your production. By delivering this high level of performance in a fully integrated VTR, GVS 2XU 4K establishes a new line of the highest quality, compact, versatile, professional grade, multi-channel Digital Recorders. Shoot 4K with RED Camera, record the monitor output directly to 2XU 4K HD SDI port and output to HD display in uncompressed 720p/1080p/2K. You can then copy the same shot from RED Camera .r3d files to 2XU 4K RAID drive. Import REDCODE "h" resolution QuickTime proxy file or native .r3d playback. From Mac or PC, you can remotely execute FinalCut Pro, Edit REDCODE media at 4K, 2K resolution 3840x2160P 24, 3840x2160P 23.98,3840x2160P 25,4096x2160P 24,4096x2160P 23.98, 4096x2160P 25, 3840x2160PsF 24, 3840x2160PsF 23.98, 3840x2160PsF 25, 4096x2160PsF 24, 4096x2160PsF 23.98, 4096x2160PsF 25, 2048 x 1080P 23.98, 2048 x 1080P 24, 2048 x 1080PsF 23.98, 2048 x 1080PsF 24, 2048 x 1556p 15, 2048 x 1556PsF 14.98, 2048 x 1556PsF 15, 2048 x 1556Psf 23.98, 2048 x 1556PsF 24 and HD # 1080PsF 23.98, 1080PsF 24, 1080PsF 25, 1080PsF 29.97, 1080PsF 30, 1080p 23.98, 1080P 24, 1080P 25, 1080P 29.97, 1080P 30, 1080P 50, 1080P 59.94, and 1080P 60 HD 720P 60.display or projector with crop mark selection. Other Features: GPIB Trigger • Crash record and Deck control • Scheduled Record • Playlist Scheduling • Advanced Disk Search • Master Slave Link • Simple expansion or removal of internal storage • rugged Field approved unit • Video Media Server • 100% 9000 compatibility • Robust, well-proven architecture • Compact physical size • Playback During Record • Proxy File During Record • Slow-Mo Playback, if you interested in 3D Stereoscopic video recording and playback refer to GVS9000 2XU 3D VTR.